With Freja Beha Erichsen opening the show sporting a white teddy bear coat around the shoulders and a metallic cosmetic box in hand, there was confirmation that this Louis Vuitton show would be a standout. 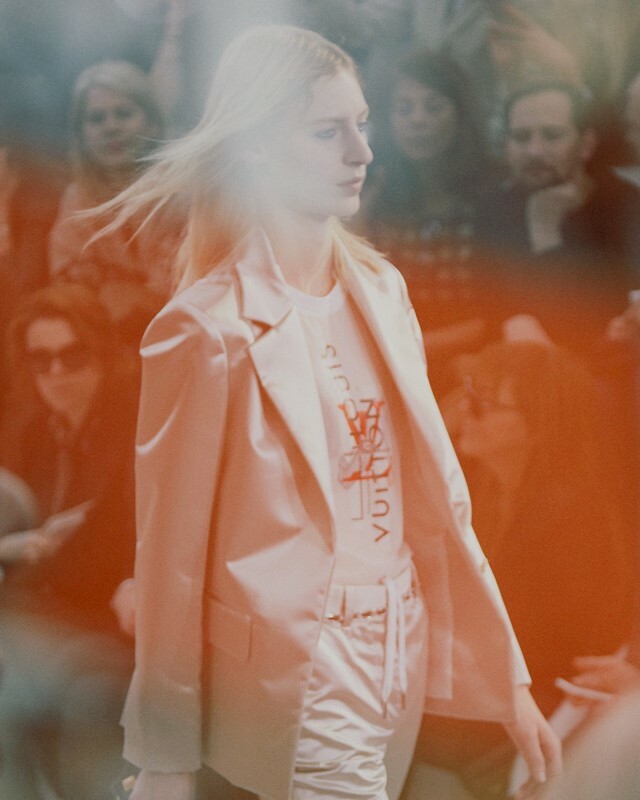 Be it with candyfloss pink hair or a shaved head (as sported by Fernanda Hin Lin Ly and Tamy Glauser, respectively), this gang of girls were there to show you that there was more to the Louis Vuitton woman than you’d bargained for. In lingerie-style dresses with cinched waists and futuristic silvers decorated by chain belts slung around the waist, the Vuitton girls – a combination of the coolest faces in the industry, including androgynous model Erika Linder, indie-cool Lucan Gillespie and rising stars Olympia and Jean Campbell returning for a second season – marched to the sound of Dazed cover girl Grimes’ “Genesis”. Power-shouldered sequin dresses were accompanied by ankle boots and differently patterned leopard print coats – as well as structured blazer/trouser combinations which included a Vuitton sheer 90s style tee. The show took place in the recently opened Foundation Louis Vuitton, a futuristic glass-made building designed by architect Frank Gehry. With a collection featuring artworks by the likes of the Dazed 100’s Ed Atkins and fine art photographer Wolfgang Tillmans, as well as having been host to a series of exclusive Kanye concerts this week, the potential of the futuristic building was harnessed with video screens projected around the show space providing a live-feed of the show.